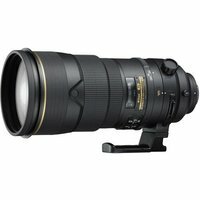 The Nikon 300mm f2.8 G ED VR II AF-S Nikkor is a professional, fast aperture, super-telephoto lens that is perfect for wildlife and sports photographers. Featuring Nikon's second generation Vibration Reduction (VR) system, it produces outstandingly sharp images even under low light conditions. The optics feature Nano Crystal coatings and three ED (Extra low Dispersion) glass elements.